FILE - An Indian flag flies on a hill in the Uri sector, near the de facto border dividing Kashmir between India and Pakistan, in Indian-controlled Kashmir, Sept. 21, 2016. "Jai Hind" roughly translates into "Long live India." There is cautious optimism in India about the U.S. suspension of about $ 1.9 billion in security aid to Pakistan to pressure it to take action against terror groups. But analysts in New Delhi say the move is unlikely to prompt Islamabad to stop providing safe havens to groups that are active in Kashmir such as the Hizbul Mujahideen. “It has abundantly, abundantly vindicated India’s stand as far as terrorism is concerned and as far as Pakistan’s role in perpetrating terrorism is concerned,” according to Jitendra Singh. Washington’s warnings in recent days that it will ratchet up the pressure if Islamabad fails to take "decisive action" against terror groups has won quiet appreciation in New Delhi, which has long complained that it is a victim of attacks by terror groups that find sanctuaries inside Pakistan. “It is too early to judge what he [President Trump] might do, but the perspective is fresh and new,” said Arvind Gupta, director at the research organization Vivekananda International Foundation in New Delhi. At the same time, many in India feel that Washington’s main concern will be to ensure that Islamabad takes action against groups that target Afghanistan, such as the Haqqani network and the Afghan Taliban because its primary focus is on stabilizing Afghanistan. There is also some skepticism about how far Washington will go in imposing punitive measures on Islamabad due to its reliance on Pakistan for access to the war torn country. Analysts say New Delhi is in a “wait and watch” mode to see how the new policy will unfold in coming months. “Would they [the United States] really proceed further, number one? Number two, whether it will take the Indian front also into consideration and stick to it,” questions Sukh Deo Muni, a South Asia expert at New Delhi’s Institute of Defense Studies and Analyses. There has been increasing sensitivity in Washington to India’s concerns on terrorism following a closer strategic embrace between the two countries – last August the U.S. administration named the Hizbul Mujahideen outfit as a global terrorist group and added its chief, Syed Salahuddin, to its list of global terrorists. Hizbul is one of the frontline groups active in Kashmir, the territory divided between the two countries. 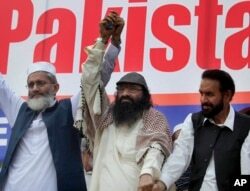 FILE - Leader of Hizbul Mujahideen, Syed Salahuddin, center, joins hands with leaders of Jamaat-e-Islami, Sirajul Haq, left, and Mian Aslam, during an anti-India rally in Islamabad, Pakistan, July 24, 2016. However, when asked why the terror groups active against India were not named during the announcement of suspension of aid to Pakistan, Juster simply said, "Pakistan is important too for the situation in Afghanistan" and stability will not be possible without its contribution. There are also some worries in India that continuing U.S. pressure will push Islamabad further towards China and expand Beijing’s footprint in the South Asian region – an outcome New Delhi does not want to see. “We are already seeing that the Chinese are probably going to set up a naval base in Jiwani (Pakistan). You have already seen that China, Pakistan and Afghanistan have formed a new grouping,” said Gupta, referring to the first dialogue of the foreign ministers from the three countries hosted by Beijing in December. Still, amid increasing frustration in India over efforts to make headway with Islamabad on combating terrorism, the new U.S. policy represents a ray of hope. Formal talks between the two rivals have been virtually frozen for two years but the national security advisers of the two countries met in Bangkok last month to hold a dialogue, which New Delhi said focused on terrorism.